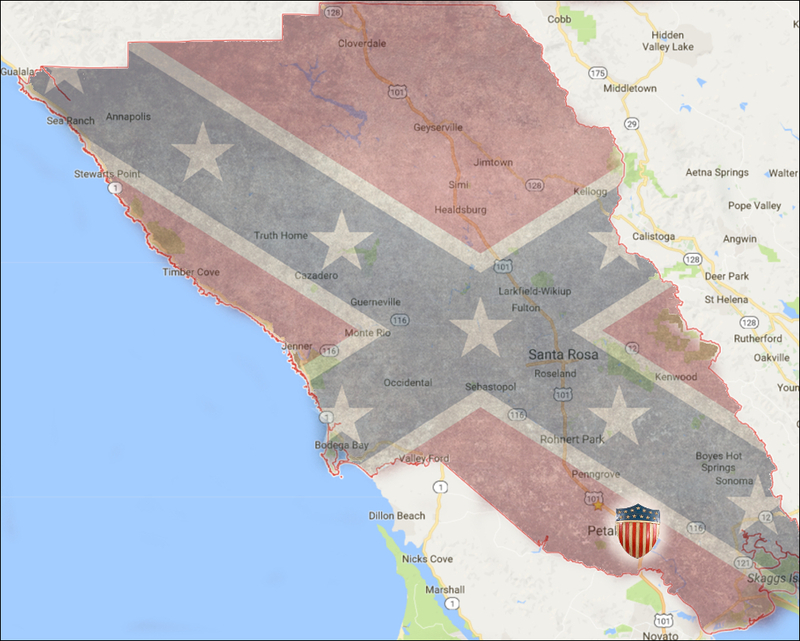 True: Sonoma county was on the Confederacy's side during the Civil War (mostly). That fact never fails to draw a reaction when it's mentioned here in an article and someone in the audience always gasps when it comes up in a presentation. To (hopefully) clarify these issues and correct some misinformation that's been floating around for decades, what follows is an overview of the Sonoma county homefront during the Civil War, using fresh statistical analysis and pointing out some relevant articles that have appeared here earlier. EXECUTIVE SUMMARY: Lincoln had support in Petaluma and some small hamlets, but never came close to winning the overall Sonoma county vote. In Santa Rosa, Sebastopol and Sonoma, Lincoln was always strongly opposed - but there is no clear explanation why those communities were so anti-Union before and during the Civil War. Five men from Sonoma county went East and enlisted as soldiers, most of them for the Confederacy. Further details on all these points are discussed below. Sebastopol has admirable things in its past as well as the awful, but goddesses help me, the cliché is true: Go back to the earliest years and the town was always quirky. Current Google results on "Sebastopol" and "quirky" - about 95,200. The town deserves plaudits for being a tolerant and (mostly) welcoming place for ethnic minorities that were hated and persecuted elsewhere in Sonoma county during the 19th century. A Native community endured continuously on the banks of the Laguna through the early 1900s, complete with their own cemetery. 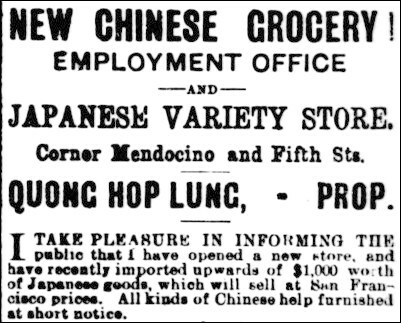 The following article shows Sebastopol had a thriving Chinatown going back to 1869, even as Chinese immigrants were elsewhere being driven out of the area. Later Japanese newcomers also found it a good place to bring their families and put down roots. On the flip side, lots of awful stuff happened in the early 20th century, particularly the child labor camps where boys as young as seven were brought up here from the Bay Area to work in the fields and canneries. Feel free to also rage over the destruction of Lake Jonive, an irreplaceable treasure which the town turned into an open cesspool and garbage dump. But there was often something different about the people who lived there. They seemed to be the sort that liked to doodle in the margins of a cookbook more than following the recipes - and I measure that by the number of times I've read something about the village in the old newspapers and found myself mumbling, "wow, that's unusual." What they often did was just...quirky. They certainly did not take themselves as seriously as some folks during the Civil War. Sebastopol sided with the Confederacy, as did the rest of Sonoma county (except Petaluma) but unlike the clench-jawed fanatics over in Santa Rosa who actually rooted for the North to be crushed, the Southern sympathizers of Sebastopol mostly enjoyed punking the mainstream "Union Democrat Party" - the so-called moderates who wanted peace declared and everything to go back as it was before Secession. "...[Mr. Worthington] was suddenly brought to a close upon that topic, however, by a remark from some one in the crowd at which he seemed to take umbrage, and closed in a terrific abuse of the citizens of Sebastopol — stating that if he came there to the barbecue, he would take good care to bring his dinner with him." The following year the Analy Democratic Club announced they were throwing another party barbecue, and all Democrats in the county were invited. (It turned out to be a very big deal indeed, with speakers speechifying from 10AM until midnight.) Right after it was announced, the Sebastopol pranksters erected a flagpole taller than anything else around, waving a Union flag and a streamer with the upside down word, "Constitution." The point, I'm guessing, was for them to hang out at the base of the flagpole and mockingly pretend to be namby-pamby Union Democrat moderates. "They had a grand 'pow-wow,' and apparently had a good time generally," commented the (pro-Union) Petaluma Argus. "The whole affair was evidently got up for the purpose of 'roping in' outsiders; but we hope with no effect. The whole affair is so transparent that nobody but very silly people can be deceived." At least once, though, the joke was on Sebastopol's anti-Yankee fanboys. During the Civil War, Fort Alcatraz was used as a military prison for Confederate sympathizers charged with seditious acts, and a telegram arrived that "Dr. Harris, Willson and Valentine, three noted rebels of Sebastopol, had been arrested for treason and would be sent to Alcatraz." Hours later it turned out to be a hoax, and much celebratory drinking followed. What's interesting about this anecdote, however, is that it seems like a "dog that didn't bark in the night" story. If some truly innocent men were sent to the slammer for the duration of the war you'd expect an angry outcry from friends and neighbors; here, the attitude seems to have been, "well, we all knew they'd get arrested eventually..."
The final Civil War episode concerns farmer Aaron Barnes, who definitely took his politics seriously. In 1863 a man named Peters came to his farm to buy a wagonload of fruit. A deal was made and Peters was invited to stay the night, as it was getting late. Late that evening - and presumably after a bottle or three had been uncorked - the conversation turned to one of the big controversies of the day: The Vallandigham affair. Clement Vallandigham was an Ohio politician who was exiled to the Confederate states a few months earlier after rabble-rousing against "King Lincoln" and the government. (Obl. Believe-it-or-Not! factoid: He died in 1871 while defending a man accused of murder, arguing that the victim had killed himself by mishandling a gun. Vallandigham was demonstrating his theory in the courtroom when he accidentally shot himself.) When Peters said he had no sympathy for Vallandigham, farmer Barnes "told him no abolitionist should stay in his house, and that he must leave; which he had to do, team and all, but without the fruit." That Aaron Barnes anecdote has weight because so little is known about him except basic genealogy (1816-1897). Yet as discussed in the next article, Sebastopol's Chinatown mainly owed its existence to him - and what happened during a period of great upheaval in his personal life also became one of the most gossip-worthy tales in the history of the county. In June of 1885, Aaron's wife Lydia/Liddy died; he was 69 years old at the time, and within five weeks he was married again, his new wife Jessie being younger than all but one of his children. A different paper noted, perhaps tongue in cheek, that after their wedding "the young couple left the following day for Lake county to spend the honeymoon." 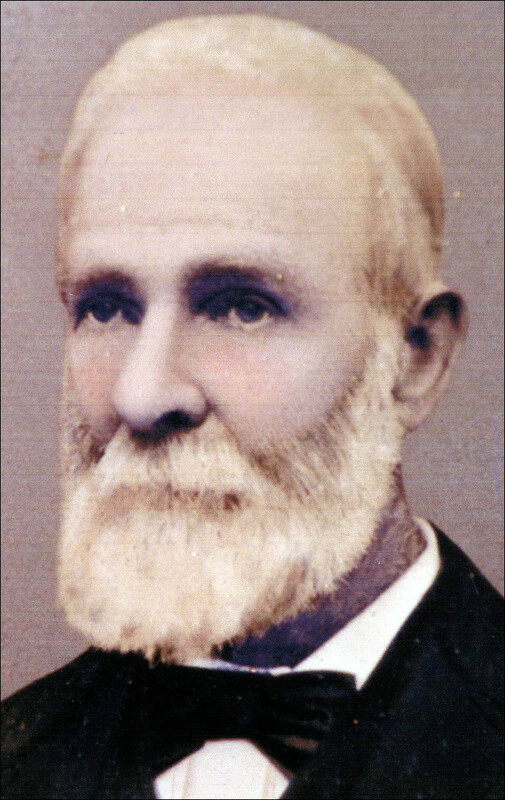 Aaron gave his new bride $14,300 in bank stock when they married, followed by local real estate in 1885, 1887 and 1889. Then in 1892 she deserted him. He sued her for breach of contract and sought $20,000 in damages, arguing "...she was not a worthy woman at the time of the marriage, and that it was a scheme on her part to obtain possession of his property." Jessie Burk Barnes freely admitted she had left him, but insisted she had fulfilled the contract by marrying a man old enough to be her grandpa. The court agreed with her. Yet that's still not the end to the story of Barnes' family eccentricities. Aaron died a few months after losing the suit, and it was discovered that he placed an unusual clause in his will requiring his estate to be left untouched for twenty years, after which his children - some of whom would have been over 70 by then - could divide it up. This was such a bizarre demand I can't help but wonder if it was intended as an attempt to protect "his" Chinatown post-mortem. The court declared the long waiting period invalid. There was still the problem that one of his children could not be found. Samuel - the only kid younger than his ex-stepmom - had disappeared while his dad was still married to her. Since Aaron died, Samuel's share of the estate was held in trust while the family had him declared legally dead in 1901. But just as his sizable inheritance was about to be distributed to his brothers and sisters, he popped up and contacted them for the first time in twelve years. All were happy he was still alive - let's generously just presume. 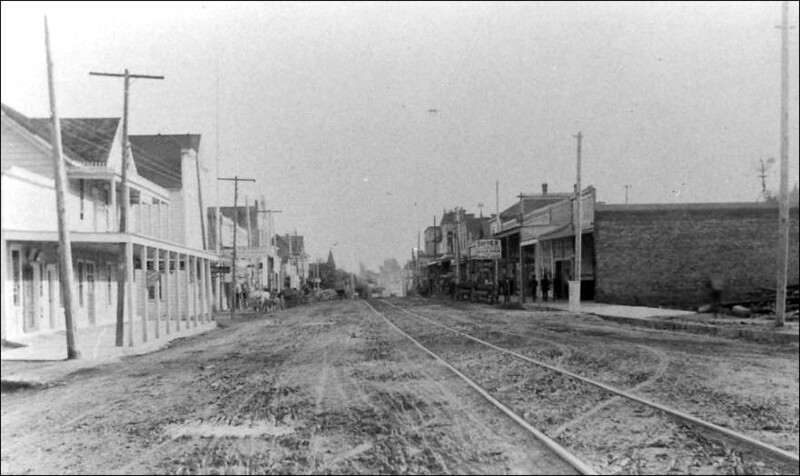 More stories about Sebastopol during the 1890s come from an obscure memoir, "The Tenderfoot Comes West" by Roy McLaughlin, who spent his teen years there. McLaughlin sketched what the village was like: "What struck me was the dust and cobwebs everywhere...All the streets were merely continuations of the several intersecting dusty roads." He wrote there were three general stores complete with "a few men [who] sat around the stove and cracker barrel and exchanged news and gossip," one full-time church, seven saloons (!) and a large winery. In the little schoolhouse seventh and eighth grade were taught together, and "...the front rows of seats were smaller than those in the rear, which were occupied by boys who were almost grown men." There wasn't much for a kid to do; they swam in the Laguna, which at the time was teeming with carp that were introduced by accident after heavy rains caused a couple of commercial fish ponds to overflow. (One of those ponds was owned by... wait for it... Aaron Barnes.) Boys hung around Chinatown - McLaughlin seemed awfully well-versed in the details of opium smoking - but they also tormented the Chinese men cruelly, as described in the next article. Most exciting was the time "...a troupe that accompanied a horse-drawn merry-go-round spent one winter month with us. They were all ham actors, but their performances in the town hall at least served to relieve the tedium during the season when no work could be obtained in harvesting fruit." There were, of course, many fine, respectable people who quietly went about their affairs. But quite in contrast were the drunkards. I have never seen so many sots of different types as were always in view. Some only occasionally got tight; others were periodic performers, and we knew about when to expect to see them on Main Street. One was of such fixed habits that he deserves special mention. This was old Doc Whitson. One could almost set a clock by his two daily appearances. Early in the forenoon he would walk up the street to the winery, and later in the afternoon would weave his course back down the street, always in an angry mood. On one side of Main Street there was an open ditch, dry in the summer and a gushing torrent in winter. The ditch at one place was crossed by a footbridge consisting of a single board. One winter night during a drenching rain our neighbor heard shots, and the lady of the house said to her husband, a mild-mannered man, "Will, somebody is shouting. You better see what the trouble is." Will lighted a lantern and went out toward the noise. Near the footbridge he saw old Doc sitting up to his arms in the water. Will politely inquired, "What are you doing, Doc?" The muffled reply was, "The inquisitiveness of a small village is appalling!" Finally, no discussion of the town's quirkiness is complete without considering how it got its name. It was originally called "Pine Grove" in 1855, and which can be verified in a Sonoma County Journal ad from that December. Trigger alert: Things are about to become very confusing. Trouble was, there were lots of other Pine Groves in the state, and the one in Amador County got the official nod from the post office in 1856. That same year the USPS also designated "Sebastopol" as the mailing address for a place - in Napa county. What we were calling Pine Grove here was officially the post office named "Bodega" and it handled every piece of mail between there and the Oregon border. Then in 1857, the residents of Pine Grove decided it would be really cool if the village were now called Sebastopol instead. The whole mess was not sorted out until 1868, and presumably not before a whole bunch of letters were returned to confused senders. That year the post office at the place everyone called "Bodega" was designated Bodega, Sebastopol/Napa was officially renamed Yountville, and Sebastopol/Quirky became recognized as Sebastopol, California. All the many other Sebastopols in Tulare, Sacramento and Nevada counties ("Sebastopol" was obviously a very popular name in the 1850s and 1860s) were left to dream up a different pseudo-Russki name. ...The formidable name of Sebastopol originated in this way: a man named Jeff Stevens and a man named Hibbs had a fight; Hibbs made a quick retreat to Dougherty's store; Stevens in pursuit. Dougherty stopped Stevens, and forbid him to come on his (Dougherty's) premises. The Crimean war was raging at that time, and the allies were besieging Sebastopol, which it was thought they would not take. The Pine Grove boys, who were always keen to see a fight--chagrined at the result,--cried out that Dougherty's store was Hibbs' Sebastopol. The affair was much talked about, and from this incident the town took its name. It's a fun story, but I can't find any evidence it is true. There were no men with those names found in the 1850 or 1860 census; that "much talked about" fight wasn't talked about even in passing within any surviving newspapers of the time (at least, currently available online). Methinks author Thompson was probably repeating some retrofitted barroom tale made up in the twenty years since. Now that story has been accepted without question, even while more details have been larded onto its ribs. Tom Gregory - author of the county's 1911 history book and a man who could lie like a salesman working on fifty percent commission - added that Hibbs' first name was "Pete" and they were slugging away at each other because they were both so, so passionate about the Crimean War which was already over. Gregory's account further dripped with gooey prose, "...so out from the red flames of the Crimea, out from the bloody rifle-pits of the Redan, out from the fadeless glory of the Light Brigade, and out from the historical scrimmage at Dougherty's came out Sebastopol. Jefferson and Peter are aslumber on Gold Ridge, mingling their dust with the rich yellow soil, with orchards to the right of them, vine-rows on the left of them, blooming and fruiting." Lordy, I do so appreciate reference books that are concise. A letter from a Sebastopudlian published by the Argus in 1865 also didn't mention the fight, but simply that they chose to adopt the name of “Russia’s renowned Fortress” - in other words, because it was considered a very honorable name. I agree with Cummings that is the most likely answer, as the writer was probably living there around the time. Cummings is a fellow newsprint spelunker and a first-rate researcher; SSU offers fifteen of his research papers online, and they have proven invaluable to me. But in this case he was incorrect on several points, particularly, "Pine Grove was renamed Sebastopol in the about seven month period between November 1855 and the end of May of 1856." Since his essay was finished in 2009, an enormous number of historic newspaper pages have come online and are searchable, providing tools he did not have. The ads published in the Sonoma County Journal show the name change happened in May, 1857 - although there are still no articles to be found about the switch. After May 22 it's always Sebastopol in advertisements, except for an old display advert from a non-local delivery company that continued listing Pine Grove as late as 1860. Sebastopol is the only community around here with a colorful story about its name, and personally I love the idea that some joker in Sebastopol may have made it up, most likely to make the place seem less respectable. From that quirky seed grew a tree that looks mostly like others in the forest until you take a closer look - and then you realize it's really not quite the same. Not the same at all, and that's something nice to appreciate. ...[Mr. Worthington] was suddenly brought to a close upon that topic, however, by a remark from some one in the crowd at which he seemed to take umbrage, and closed in a terrific abuse of the citizens of Sebastopol — stating that if he came there to the barbecue, he would take good care to bring his dinner with him. He then thanked those who had given him their attention, and took his departure, feeling pretty well satisfied, we expect, that Sebastopol was not a very good place for an itinerant political preacher to stop at. SECESSION IN SEBASTOPOL. -- Last Saturday the Democratic party, which now spells its name "Secesh," erected a pole 91 feet high, and hoisted the Union flag upon it, surmounted with a streamer, bearing the word "Constitution," upside down. Then they had a grand "pow-wow," and apparently had a good time generally. The whole affair was evidently got up for the purpose of "roping in" outsiders; but we hope with no effect. The whole affair is so transparent that nobody but very silly people can be deceived. The conduct of the Secessionists reminds us of what some travellers tell us about the habits of the ostrich. When it is pursued and wishes to escape observation it thrusts its head into the nearest sand heap and leaves its body sticking out. Not until it feels the blows of its pursuer does it find out its mistake. The Union party very plainly see the body of Secession sticking out of all these so called Democratic demonstrations, although its head is hidden; and when the day of next election comes we hope that a vigorous application of boot-toe will emphatically convince the Secesh ostrich that it has deceived no one but itself. BADLY SOLD.--The Constitutional Democracy were badly sold last Sunday. W. L. Anderson telegraphed from Santa Rosa that Dr. Harris, Willson and Valentine, three noted rebels of Sebastopol, had been arrested for treason and would be sent to Alcatraz. As the despatch came from a rebel, they believed it to be true, and many a long face might have been observed on our streets. BADLY SOLD Until the evening stage arrived in Petaluma with news that the report was false, the earlier report in the telegram from W. L. Anderson, a rebel from Santa Rosa, was believed – that three noted rebels of Sebastopol, Dr. Harris, Wilson and Valentine, had been arrested for treason and would be sent to Alcatraz. A constitutional expounder in Petaluma offered to bet $500 that the arrests resulted from the lying of the awful fellow, Joe McReynolds. Democracy rejoiced with great joy and the indulgence of “tangle leg fluid” when the initial report was exposed as a hoax. Editors Alta: Yesterday evening a circumstance occurred here which illustrates the principles of the Copperhead Democracy so perfectly, that I must give it to you for the benefit of your readers. On the 3rd, Mr. Gordon Peters, a Union man, went to the house of Aaron Barnes, a Democrat, for the purpose of purchasing a wagon load of fruit. Terms were agreed upon between the two for a load, and Peters was invited to stay all night. In the evening, about 9 o’clock, Barnes commenced talking about the state of the country, and finally asked Peters what he thought of the arrest of Vallandigham. Peters replied that he thought it was right and proper, whereupon Barnes commenced abusing him, and told him no Abolitionist should stay in his house, and that he must leave; which he had to do, team and all, but without the fruit. The above facts I had from Mr. Peters himself this morning, and as he is a man of first-rate standing, there can be no doubt about their truth. Comment is unnecessary. ANOTHER SEBASTOPOL - The name of the Post Office at Sebastopol, Sonoma County, has been changed from Bodega to Sebastopol, and John Dougherty has been appointed Postmaster thereof. The name of the Post Office at Smith's Ranch will be changed to Bodega. These changes have become necessary by the settlement of the country. Bodega Post Office hitherto has been located at the town of Sebastopol, fully ten miles from Bodega Corners, and the Post Office at the latter place has been known as Smith's Ranch. The names are now made to conform to the localities more nearly than before. The Bodega (now Sebastopol) Post Office was the oldest established in the county except that at Sonoma, and its establishment was the most northern Post Office above the Bay of San Francisco and west of the Sacramento Valley -- letters for everyone up to the Oregon line being sent to that office. We now have three Sebastopols in California, but only one of them has a Post Office by that name. The Post Office at Sebastopol, Napa County, is now called Yountsville [sic], and the Sebastopol in Sacramento County had no Post Office at all, so far as we are informed. The wedding of Mrs. Josie Burk, of Santa Rosa, and Aaron Barnes, of Sebastopol, took place on Sunday afternoon of last week at the residence of C. A. Reigels, on Sonoma avenue, in the former place. Smilax and cut flowers adorned the parlors. The ceremony was performed by the Rev. T. H. Woodward, in the presence of the relatives and a few invited friends. After the marriage rites, a wedding supper was served at tete-a-tete tables, where the bridal cake was cut. The health of the bride was drunk by those present in bumpers of sparkling wine. The young couple left the following day for Lake county to spend the honeymoon. Some five weeks ago Aaron Barnes, a very wealthy citizen, of Green Valley, lost his wife. Though on the shady side of life, between seventy and eighty years of age, the old gentleman concluded that the term "single blessedness' was a misnomer, and a short time since commenced looking about him for another partner. He met a musical gentleman named Professor Parks, to whom he proffered $500 in consideration of his finding him a suitable wife. The Professor readily accepted, and in a short time a lady from the East, twenty-seven years of age, attractive and cultured, agreed to share the old man's wealth. The latter desired to settle upon his fair young intended $30,000, besides two cottages in Santa Rosa,and her legal advisor pressed her to accept, but it seems she was modest, and would receive but $10,000 in money. On the strength of this they were duly married, and it is stated that few men are prouder to-day than the happy groom. Aaron Barnes Sues His Wife. Aaron Barnes of Sebastopol was married to Jessie Burk in 1885, and they lived together as man and wife until August, 1892, when she left him. Previous to tbe marriage the plaintiff deeded to the defendant $14,000 in personal property, and now be wishes to recover $20,000 in damages for breach of contract. The defendant appeared by demurrer Monday before Judge Dougherty, and while she admits the facts of desertion as alleged, sbe denies the conclusion and the breach of contract. In his judgment sustaining the demurrer Judge Dougherty says that as the sole consideration of the contract and transfer of the property was marriage and the marriage had been executed, therefore desertion afterwards could constitute no breach that would effect the property transferred to her, although tbe parties were not living together since 1892. The plaintiff sets up the plea that the defendant was not a worthy woman at the time of the marriage, and that it was a scheme on her part to obtain possession of his property, and that part of the plan of the defendant was ultimately to leave him. To all this the defendant filed a demurrer and the judge sustained the demurrer and granted ten days for tbe defendant to amend. There were up to 1,500 men crowded into Santa Rosa's Armory that winter's night. Some were there because they were angry, some were curious and some were frightened, but all there learned that racial discrimination was now a civic duty. It was the first official 1886 meeting of the Santa Rosa Anti-Chinese League. Spoiler alert: this is not a pleasant story, yet it's not nearly as awful as some try to portray. A few days before, a meeting was held to elect a "Committee of Fifteen" which would write a mission statement. * They composed a resolution stating any Chinese presence in Santa Rosa was a "source of great evil" and detrimental to the "white race." Chinese immigrants should leave town ASAP and Santa Rosans should sign a pledge vowing to boycott their businesses and fire any Chinese workers they might have. Santa Rosa was actually a latecomer - and although about half the men in town showed up, attendance was relatively light. Meetings had been held previously in Petaluma (2,000 there) and Cloverdale (1,000). At Healdsburg almost the entire town came to their first meeting and their Chinese boycott was already going strong. The resolution also asked the Santa Rosa City Council to appoint additional policemen for night duty to prevent "riotous demonstration by white persons toward Chinamen". That was a very real concern; throughout the West, anti-Chinese sentiments had been escalating from grumbling newspaper editorials to acts of violence, even mob riots. Newspapers reported local bigwigs were having "secret meetings" to figure out how to get rid of the Chinese - although telling a reporter about it seems to defeat the whole secrecy biz. In Wyoming, white miners went on a rampage and murdered at least 28 Chinese men with many burned alive. Three more were shot to death in Washington state over hop picking. A mob armed with clubs drove out Tacoma's 350 Chinese residents which was followed by the razing of their neighborhood. Federal troops were stationed in Seattle because vigilantes were itching to attack the large Chinatown there, which was the home to 1 out of 10 people in the town. And matters were about to become far, far worse; even as our ancestors were getting organized in Santa Rosa, thousands of Chinese immigrants were escaping to Portland from Oregon's interior under vigilante threats. The shadow of madness had fallen upon them and enveloped the sun. Yet it's quite possible the anti-Chinese frenzy might have bypassed Sonoma county - if not for the Wickersham murders. Sarah and Jesse Wickersham were a reclusive couple who were brutally killed at their remote cabin west of Cloverdale in mid-January 1886. The presumption of guilt immediately fell upon their Chinese cook, who could not be found and was presumed to have fled to China. As explained in my four-part series, it's highly unlikely he had any hand in it but everyone at the time was certain of his guilt, thanks in great part to two racist law enforcement officers who were widely quoted in the initial accounts. They told reporters there was no question the "Chinaman" slaughtered them and hinted Sarah had been raped (possibly gang raped) - a lie they continued repeating even after the Wickersham family asked them to knock it off. ...The tragedy that occurred in the northwest portion of this county on Monday last, where two of our most highly respected citizens, man and wife, were murdered in cold blood by a Chinese fiend, has done much to increase the bitterness against a race that are most wicked and inhuman. It only proves the assertion that they have neither conscience, mercy or human feeling and think no more of murdering a human being than they do killing a pig. They are monsters in human form, cunning and educated therefore more dangerous and vile. Let us get rid of them and at once. The first anti-Chinese Leagues in the county were formed just a few days later. Up to then, both the Republican and Sonoma Democrat had occasionally used the popular catchphrase, "the Chinese must go" in an editorial or in a reprinted item but it was framed in the abstract, as if "the Chinese" were different than the immigrants who lived and worked here. Just two days before the Wickershams were killed, the Democrat ran a sort-of travel story describing a tour of the Santa Rosa opium dens. It concluded with mention that the Chinese community here had both a Masonic and an Odd Fellows lodge. While our newspapers portrayed the Chinese immigrants as an exotic (but somewhat suspect) underclass, the local economy depended upon them. In the towns, the Chinese did our laundry and sold us produce from pushcarts on the streets - Santa Rosa had six roaming vegetable vendors. On the farms and in the vineyards they did the hard work no one else wanted to do. And everyone in town or country who wanted a cook or house servant could find a Chinese man or boy ready to hire. 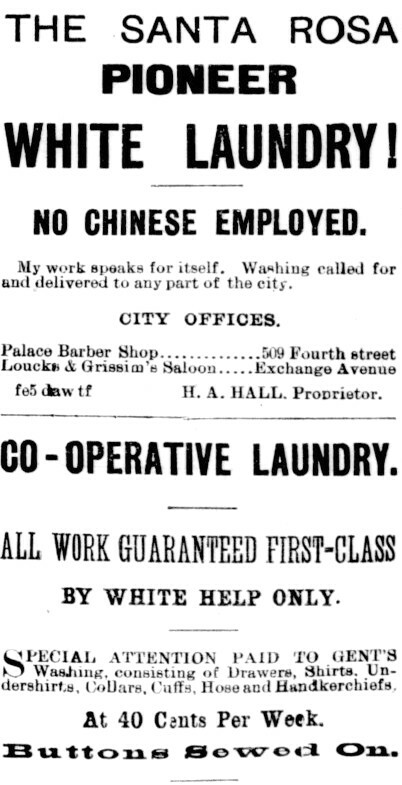 Because they did all this for less money than anyone else, they were in great demand; in 1885 there was a Chinese employment agency on Fifth street. Their low wages led to accusations they were “taking jobs away from Americans,” exactly mirroring the anti-Latino immigrant bias of today. In some cases it was true; companies used Chinese workers as strikebreakers or to replace an entire workforce. 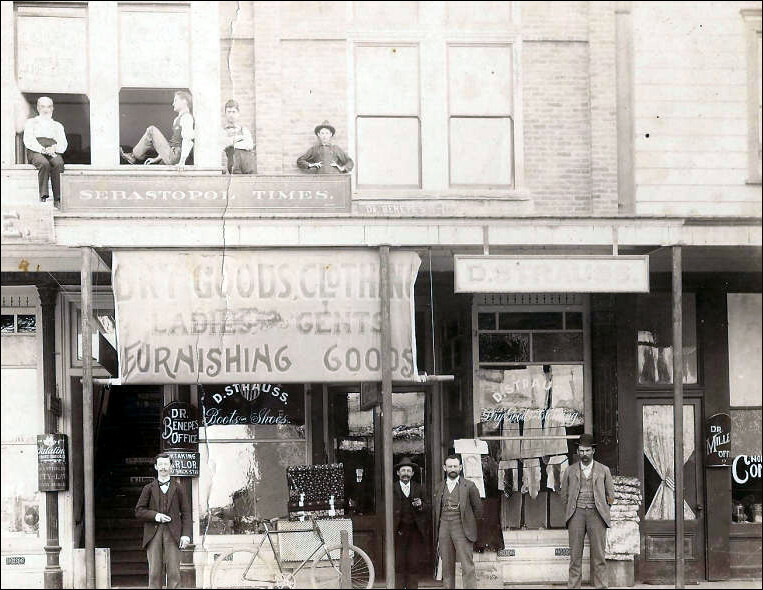 But in truth, good manual labor jobs were scarce at the time not because of the Chinese but because the national economy wasn't so hot; effects of the Depression of 1882-85 began to be felt locally with an uptick of newspaper articles about "tramps" in the area. "These men, with few exceptions are in destitute circumstances and are compelled to move from place to place in search of employment," sympathized the Democrat paper, while at the same time noting that many were responsible for burglaries and other theft. The paper suggested that the first Anti-Chinese League meeting have an aftersession so everyone could discuss what should be done to "protect the women and children" who were hesitant to leave home lest a vagrant break in. Meanwhile, there were now an estimated 600+ Chinese living in Santa Rosa according to the Democrat - likely an all-time high. Some had just arrived from Cloverdale and other places where Anti-Chinese Leagues were already acting out. 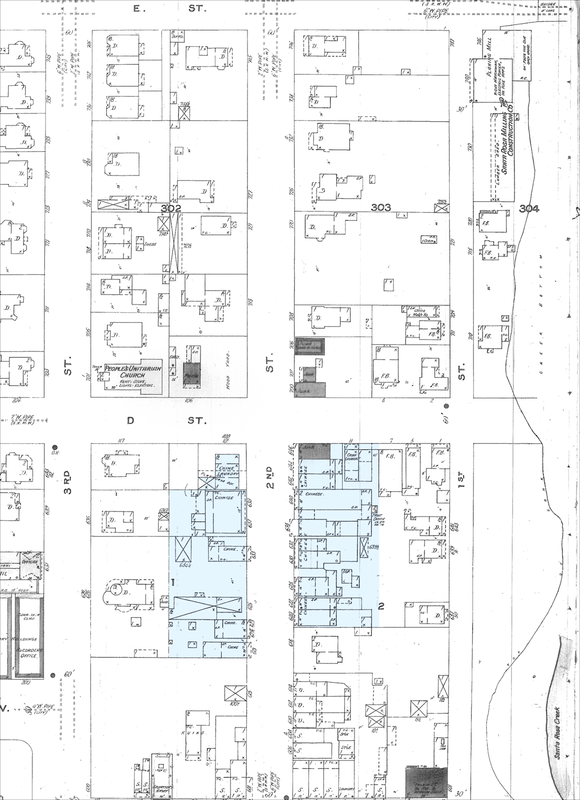 A week after that big League meeting at the Armory, the Committee of Fifteen visited these locations as "forty or fifty citizens accompanied the committee on its rounds," the Democrat observed, which probably made it look like quite the intimidating mob. Committee president John Kinslow - speaking "in good pigeon-English" [sic] - told them that as of the end of the month, "all white men would cease to patronize them" and they should leave. From the description in the Democrat it appears some of the immigrants misunderstood and thought he was offering to pay for their passage back to China, which most greatly desired but could not afford. The committee also divided Santa Rosa into seven wards, each with a few men expected to walk the neighborhood and ask residents to sign the boycott pledge. Lists of the ward men appeared in both town newspapers and are reproduced in the source notes. Both lists have 49 names, of which only five appear in any other articles about the League. Aside from some spelling differences the lists are the same with two exceptions: One adds "James Gray" in ward five and the other includes "Burbank" in ward two. On the basis of the latter mention, the Press Democrat published two articles and an editorial in May, 2018 claiming Luther Burbank was a racist and leader of the Anti-Chinese League - see discussion here. As the month of February rolled on, news was mixed. 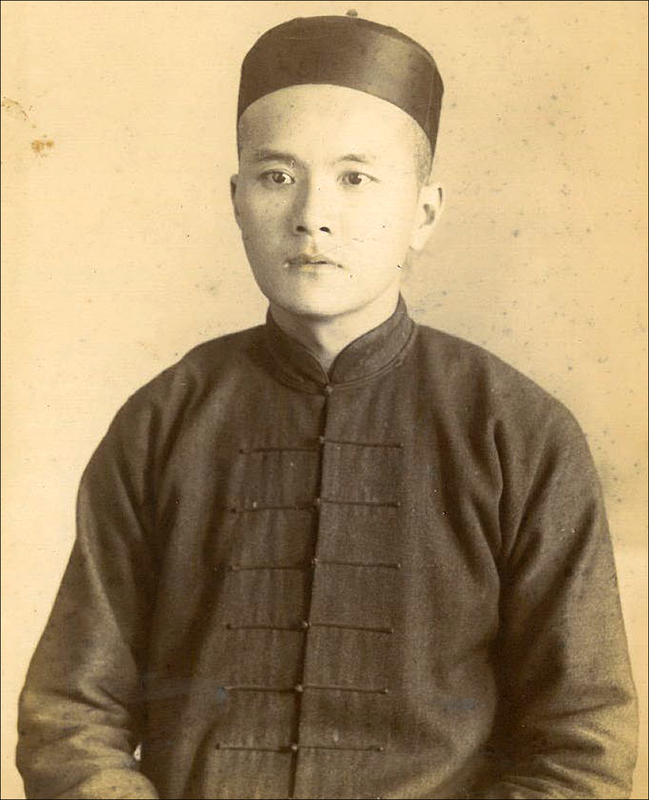 There were regular items about Chinese immigrants trickling out of town, countered by articles of some vowing to stay. The Democrat found one Chinese laundry with half its workforce idle, followed a few days later by a story that the white laundry wagons "didn’t have enough aboard to make a decent load for a poodle dog." An interview with an immigrant called "Hoodlum Jim" said the boycott only served to "get rid of the scum of the race, and the others were glad of it, but the better class would stay here, just the same." It was remarked that "white labor is scarce in Santa Rosa" yet many Chinese men were out of work and crowding into the tenements on Hinton avenue to save money. It was also written that they were going hungry, reduced to foraging for greens along the banks of the creek and on the Plaza. It's difficult to understand how that could be the case, given that Chinese truck gardens had been feeding the entire town not so long before. Oddly, the only real conflict in Sonoma county centered on Duncan's Mills. The League in that vicinity had a torchlight rally and marched on the little Chinatown there to demand the residents clear out. The mill owners contacted the U.S. Marshal and asked him to appoint a deputy to protect the Chinese workers. Complaints over this went on for weeks, with the Republican paper and the Leagues squawking the involvement of a federal officer instead of local police, plus that it was really a labor issue because the mills were using cheap Chinese workers instead of white men in the community. The March 1 boycott deadline came and went, but apparently little changed. A banner was hung over a downtown street reading, “The Chinese Must Go; We Mean Strictly Business!” In terms of threats, that ranked down there with a schoolyard bully drawing a line in sand while toothlessly bellowing, "you step over this and you're really gonna get it!" In truth, there was little the Santa Rosa Anti-Chinese Non-Partisan Association (hey, new name!) could do to force the immigrants to leave, short of violence. Attention of the League - uh, Association - turned to Plan B: Boycotting fellow Americans who weren't boycotting the Chinese. That sort of "nuclear option" was discussed at the beginning, but it was not believed matters would come to that. The Committee's subcommittee on the issue hashed it over; local farmers were saying they depended on Chinese workers. If there was to be a boycott of the farmers as well as those who wanted to hang on to their Chinese domestics and other workers it would cause "strife and bitterness" in the county. "We do not believe that a general boycott can be made successful at the present time," the subcommittee concluded. By the end of the month, the Committee of Fifteen was hunkered down in its racially-pure safe place muttering about retribution against "backsliders." State Assemblyman Allen suggested they should publish the names of all those who signed the pledge but still "either allowed their families to patronize the heathens, or did so themselves." He was voted down. In Santa Rosa, the fight came to a head over strawberries. After receiving his own little visit from Committee "investigators," Mr. Crawford took a wagon load of his strawberries to Santa Rosa. He hitched up on Fourth street, according to the Democrat, and began selling his berries by the box. "His price to Chinese boycotters was $1 a box, and to all others thirty cents. It was but a very short time before he was entirely sold out." But pushback to the anti-Chinese movement was happening all over northern California. The Sacramento Bee ran a story about a housewife seen buying vegetables from a Chinese peddler and a "spotter" rushed over to confront her, demanding to know the name of her husband. When she indignantly refused he sneered, "You must be a lover of the Chinese." Yet the bigots in Santa Rosa kept wandering even farther into the weeds. The Committee of Fifteen appointed a Committee of Nine "to act on the outside, to keep their eyes open, talk with the people, see what is going on and report to the League." For those who were unwilling to cooperate with the boycott "the League should not hesitate to treat them with severity." Further, it was proposed that a committee "should go to all the business men in town and present the membership roll and request them to sign the same and pay the initiation fee of 25 cents. If they refuse then the League will know where to find them. He thought there were but two sides to this question — either for or against the cause." ...signs may be frequently seen done in chalk on the sidewalks. They, to us, unintelligible signs are in the form of a large arrow or dart, surrounded by figures and small signs. By following the direction of the pointing arrow you are led to a similar one on the next corner, and so on until you reach the place of meeting. At the last meeting, beyond the river, some forty of our citizens were seen to pass into a building. All our efforts to learn anything in regard to the organization have so far failed. It is a branch or lodge of a secret order existing in this state, whose sole object is to rid the country of the Chinese. By every measure, Santa Rosa's anti-Chinese campaign was a flop. The last League meeting I can find mentioned was poorly attended and came only seven months after it was formed. A newspaper item at its peak revealed the League's dues-paying membership was merely 43. It may seem a victory that the population had dropped by half after the League began in February, but even that claim is shaky on closer examination. House servants, pushcart sellers, laundry workers and the like were the smallest categories of Chinese immigrant labor - most men worked in the country for much of the year, staying in tents or bunkhouses near where they were employed. (The state Labor Commissioner said that year there were "30,000 Chinamen employed in the hop fields, vineyards and orchards.") These men only came to live in the towns during winter, so it was the customary pattern for them to begin trickling out of Santa Rosa and other urban areas as spring approached. What happened as the seasonal work ended that year is a mystery. Now that the League was gone the local papers lost interest in writing about all things Chinese, and returned to the old pattern of only writing about the men when someone was arrested or created a commotion. There was one mention that because hop-picking was over "the Chinese are returning to San Francisco by the carload," so perhaps some of the Sonoma county immigrants chose to spend their winter in the big city than come back here. 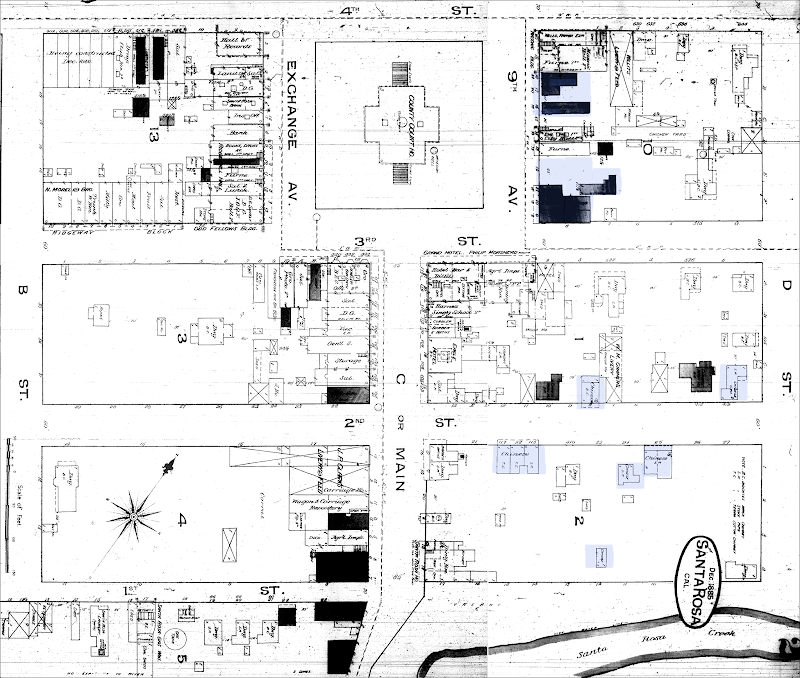 In the years that followed, Santa Rosa's Chinese community migrated to the corner of Second and D streets to form a compact little Chinatown (see 1908 map here). 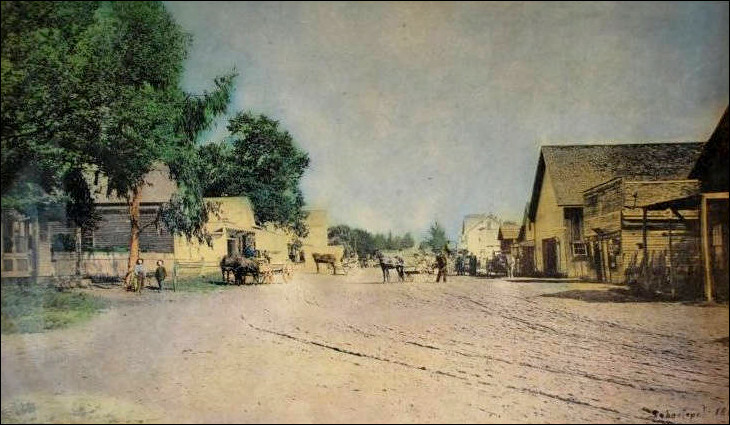 There would be little or no growth of that neighborhood in the years that followed, but not due to any discrimination by the town or racist nonsense from white citizens; it was because a different place had emerged as a hub for Chinese-American culture and business in Sonoma county - Sebastopol's two Chinatowns. * Membership of Santa Rosa's "Committee of Fifteen" was never explicitly listed in the newspapers, which only named those in attendance at meetings. Membership seemed to fluctuate over the first part of 1886. Some either did not attend meetings regularly or dropped out while new names appeared. Looking over all newspaper coverage, there seems to have been an overall core group of thirteen men, with eight of them being very outspoken. In rough order of frequent mention: John Kinslow, David Sheward, Assemblyman Samuel I. Allen, Lawson Ross, Frank Muther, Peter Towey, James W. Ragsdale, Jacob Harris, Ellis Morrow, Charles Bane, M. V. Vanderhoof, John F. Smith and Frank Berka.